I’m honestly not sure what Santa is bringing, because I totally forgot to make a list this year, but here are a few books (out of a long long long list of books I’d be happy to see by my stocking Thursday morning) that I definitely wouldn’t mind Santa bringing. If any of you have read these books I’d love to know your thoughts. I’d also love to read what book(s) you are hoping to find under the tree Christmas morning … if you celebrate Christmas, which I realize not everyone does. 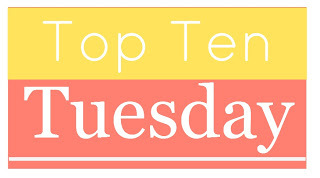 This entry was posted in top ten tuesday and tagged books, Christmas, Top Ten Tuesday by Alison Doherty. Bookmark the permalink. I just read Amy and Roger’s Epic Detour by Morgan Matson and I can’t wait to read more of her books! Ooh yes, I definitely need Since You’ve Been Gone as well! I’ve heard some good things about Brown Girl Dreaming also. Hope you have a fantastic Christmas! Both books sound so good! I can’t wait! These Broken Stars was an enjoyable book and I hope that you get to read it soon. I recently finished The Jewel and it was a meh for me – I rated it 3 out of 5 stars. Great list and Merry Christmas! Interesting! Thanks for letting me know! Oh yes, Brown Girl Dreaming! Have you read it? I really want to! I just finished the first book in the series this morning and already have the second one. I put Winger by Andrew Smith on my TTT but I also want to read Grasshopper Jungle. Since You’ve Been Gone is so so good. I hope you get to read that one soon! I’ve heard good things about both Andrew Smith books and I can’t wait to read Since You’ve Been Gone. Looking forward to your thoughts on SYBG! I know! Those covers are gorgeous! Since You’ve Been Gone is on my list too! And I LOVE the cover of These Broken Stars! Hopefully Santa leaves you some goodies under the tree this year! Here’s my Top Ten! Thanks! Hope you get Since You’ve Been Gone as well. I have a new love for Morgan Matson! I really enjoyed both Since You’ve Been Gone and A Little Something Different…such adorable reads!